What can you do at home to keep your animal companions healthy, happy, and safe from toxic chemicals? Shirley Moore, founder and director of Save A Dog, has saved hundreds of dogs from euthanasia by preparing them for adoption with the simple natural methods in this book. 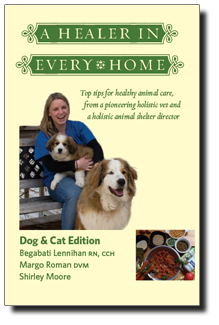 Dr. Margo Roman, trailblazing holistic vet, incorporates acupuncture, homeopathy and herbal medicine in her practice at MASH (Main Street Animal Hospital) in Hopkinton, Mass. Begabati Lennihan, RN, CCH, practices at the Lydian Center for Innovative Medicine in Cambridge, Mass. and authored the companion volume for treating people.